PMI is at It Again! Hey folks! Jill and Morgan here! 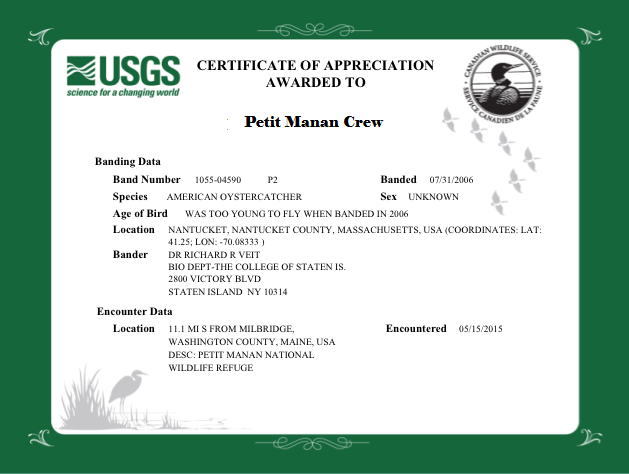 It’s been a surprisingly beautiful first week on Petit Manan Island; let’s hope it’s a sign for the whole season! The island has been lively thus far with approximately 200 prospecting Common and Arctic Terns, but we’re expecting many more to come! Although PMI isn’t the largest of islands, it still receives a good deal of visitors, especially early in the season when birds are migrating North – we’ve seen 61 species thus far! Not all our guests have been of the bird variety though; we also stumbled upon a juvenile Grey Seal on our rocky shores earlier in the week! The start of the season means preparing the island for all the work to be done in the months ahead. 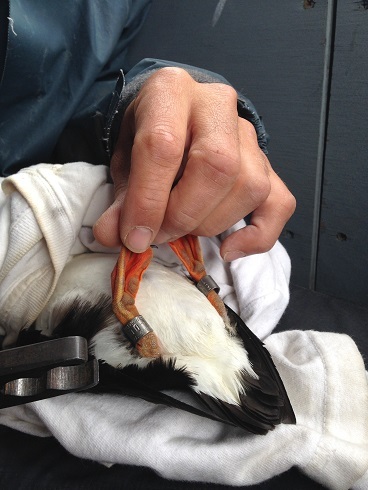 This means setting up observation blinds, for band resighting and future monitoring of foraging habits and chick health, as well as collecting marine debris, building burrows for Black Guillemots and Atlantic Puffins, and marking potential Leach’s Storm-petrel burrows. 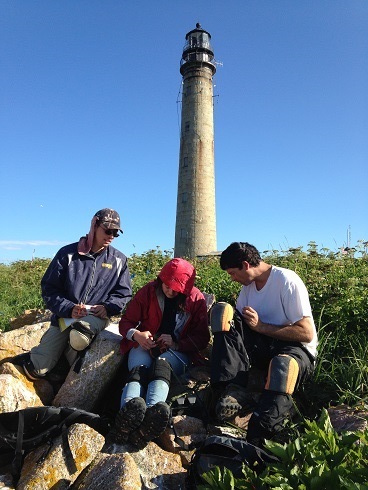 Daily Alcid counts from the top of the Petit Manan Light have also begun. On a windy day it can get rather cold up there, especially for Jill, who hasn’t quite gotten used to the Downeast summer having just returned from a seabird job in the Galapagos! Can you spot the Leach’s Storm Petrel burrow? We’ve been searching the island for these small holes in the ground this past we week, and we have found 170 potential burrows! As we prepare ourselves for the research season ahead, the birds are doing the same. 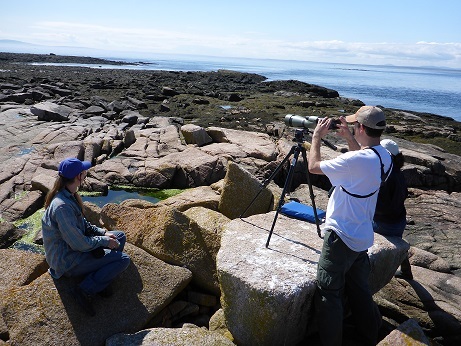 The puffins and guillemots are seeking out rock crevices and other sufficient and creative hiding spots for their burrows. The male terns are attracting their mates with a Sandlance dowry. The Common Eiders are seeking out areas of high vegetation to form their nests. And the Peregrine Falcons, Merlins, and gulls lurk about hoping to catch a bite to eat with all these new dining options in town. 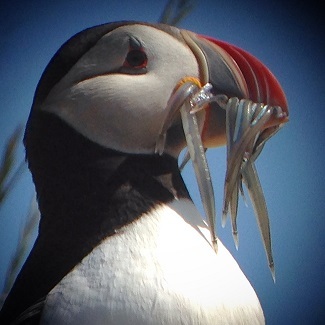 The Atlantic Puffins have already begun choosing burrows! 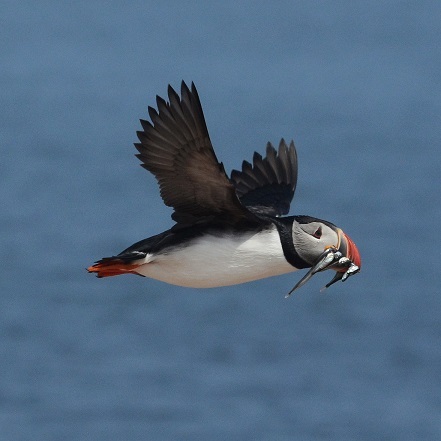 Till next time, here’s a joke to hold you over – Why did the Puffin have a stomach ache? Because it had Alcid Reflux! This is the Captain, who lives on the walkway in front of the house. What makes him so special to us is he was rescued from freezing rain when he was still inside his egg. One rainy day the area where Captain’s nest was got flooded with collecting rain water. The whole nest and the three eggs inside it were completely submerged in the water and were floating around. The parent was hovering over the nest, unsure of what to do. After seeing this I quickly ran outside and scooped up the nest and re-located it to a nearby high-elevated area. Seconds later Captain’s mother was back on her nest. 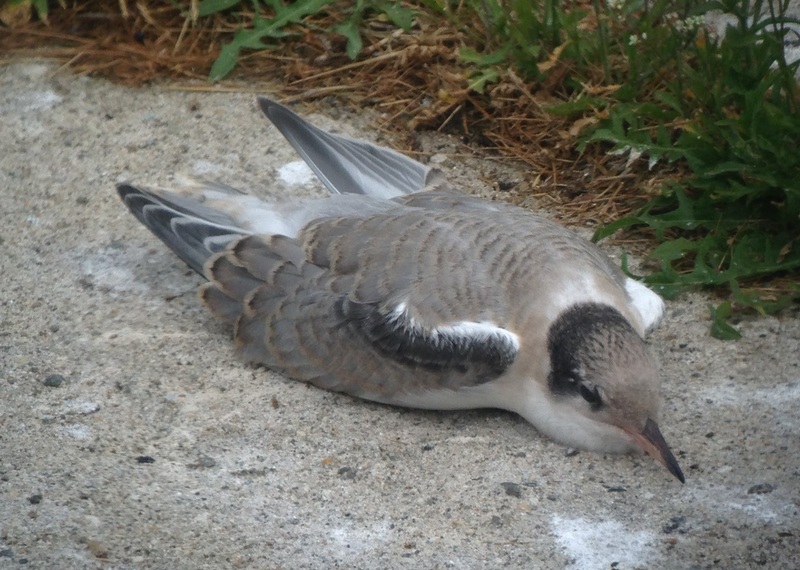 I was relieved to see this because terns can be sensitive to any slight change to their nest and can be spooked away if they feel something is wrong. Unfortunately, I still didn’t have high hopes for the chick’s survival. I didn’t know how long the eggs were floating in the cold water, they could have passed away from the cold temperatures or from the water sealing up the pores on the egg which lets the chicks breath oxygen from the air. 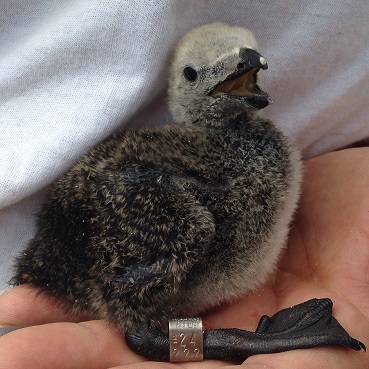 But, to my surprise about a week later Captain hatched and soon after so did his brother, Sailor. I named the chicks this because the nest was floating around like a ship at sea. 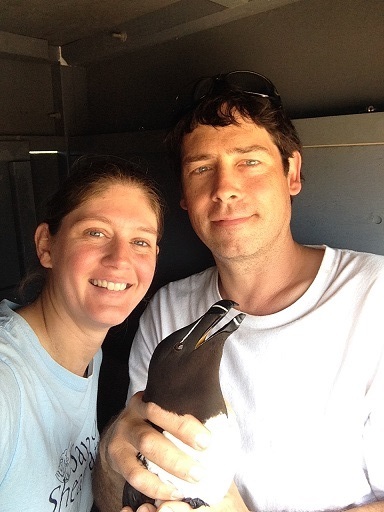 Now, both Captain and Sailor are fledging! 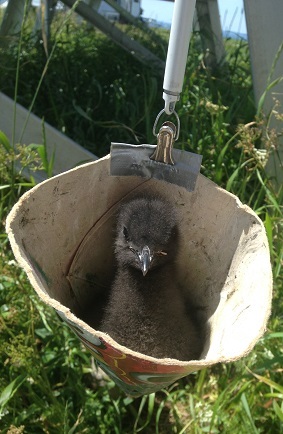 We have over 2,000 chicks on the island and just our presence here increases the survival rate for these chicks. 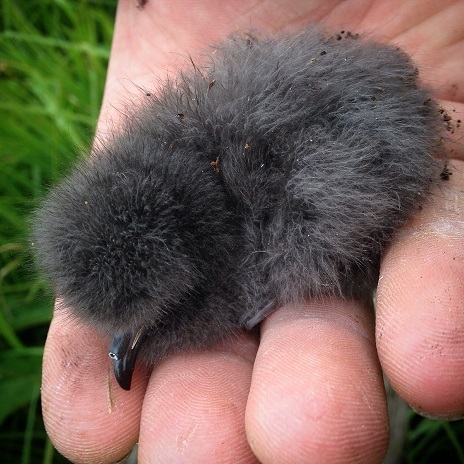 This is because we deter predators like greater black back gulls, peregrine falcons, herring gulls, and more which will make a quick meal out of the fledging terns and chicks. Realistically, we can not 100 percent stop predation from these species, but we work hard to keep fatality numbers low. Without us working here on the island these birds would likely take over and would have a devastating blow to the tern population. It made me so happy to see that Captain had made it but I noticed I gained a lot more than just satisfaction from seeing him survive, I gained a new understanding of my time here on the island. This event encouraged me because it really showed how my time and work on the island present on the island. 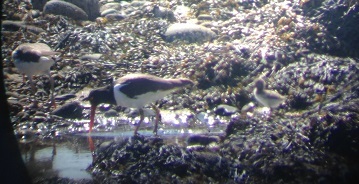 On our second visit over to Green Island we were combing the north-west side for any sign of Oystercatcher eggs, when we noticed that our 9 year-old banded AMOY, with its mate, were unusually vocal. So, we decided to move out of the area and use a spotting scope to watch from a distance. After about 15 minutes of scanning around we noticed tiny little chick heads in the rocks and sure enough they were 3 oystercatcher chicks! We all watched through the scope as the adults foraged around and were surprised how quickly the adults can extract the meat from a mussel and feed the chicks (about 3 seconds). AMOY chicks will usually stay with the adults for up to a year to perfect their foraging techniques. Foraging AMOY with 2 chicks: you can see how camouflaged the chicks are. After further research by Linda Welch we were informed that these were the first AMOY chicks to be discovered on Green Island since 1997! 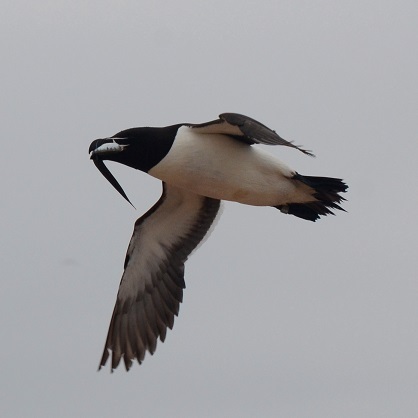 Not only that, they have now become the most northerly breeding pair within their range. How cool! We always thought that Green Island seemed like a perfect place for AMOYs to nest, and have seen them loafing there in recent years, but never found any eggs or chicks as the adults are very secretive. With just a few alarm calls by the adults, the chicks instinctively hide deep in the rocks of the intertidal zone. Each adult will constantly call and try to lure any predators out of the area. We just hope this pair can keep the prying eyes of the gulls away from discovering their chicks so they can grow up and successfully fledge. And we even received a certificate for our efforts.